An acid trip for your skin! 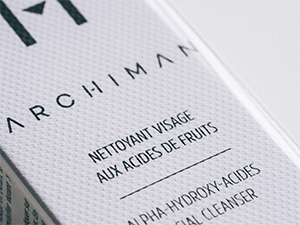 This face-cleaning gel with fruit acids deep cleans your skin without affecting the hydrolipidic membrane. The fruit acids (AHA) in the face-cleaning gel work miracles on your skin: they reduce the cohesion of dead cells, so they can be shed more easily from the surface of the skin, they stimulate the renewal of cells as well as the synthesis of collagen and elastin which restore the skin’s muscle tone and elasticity. This face-cleaning gel is the best way to give yourself a new face in only one minute: it restores the sparkle in your complexion, smooths away surface imperfections, alleviates discoloration problems and reduces the depth of wrinkles. Your skin is clean, ultra-soft and reinvigorated. Place a small amount of product onto the palm of your hand. Apply to a damp face and neck avoiding the eye area. Massage in for 1 minute and rinse off carefully. This face-cleaning gel with fruit acids can be used daily, for a perfectly cleansed skin that is smooth and sparkling. Enjoy the caress, because even on acid you are the master!